By the year 2030, Australia’s health workforce is predicted be short by 123,000 nurses. For the current profession, that means that most of you will have decided to retire and the Millennial generation will be the future of the nursing workforce. 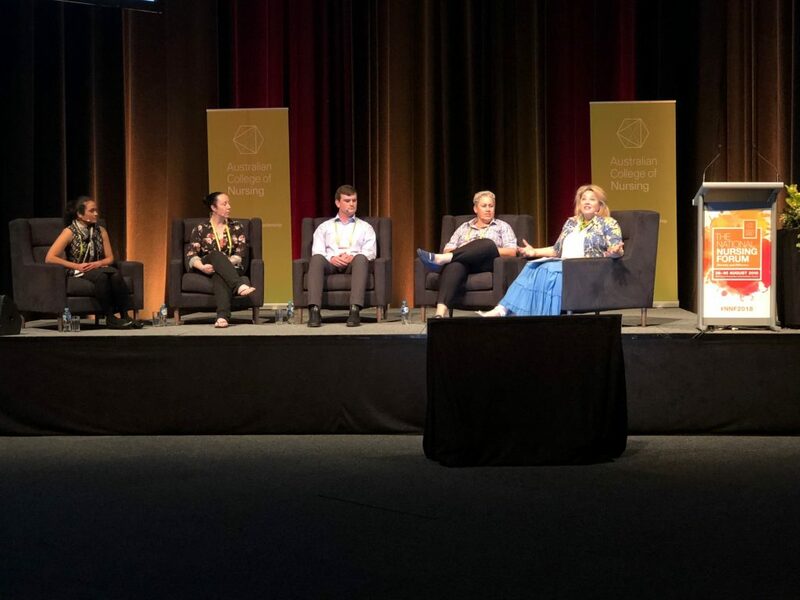 This year at ACN’s annual signature event, the National Nursing Forum, we initiated a new interactive panel and audience discussion titled ‘Next Generation Health Care – Millennials making the Difference’. Our CEO Adjunct Professor Kylie Ward FACN facilitated the session on Day Two of the Forum, with the panel members being Emerging Nurse Leaders (ENL). “Our younger colleagues are exceptionally well-placed to provide insight on the issues that the nursing profession will face and how we might address these issues now,” said Adjunct Professor Ward. During the conversation, the participants shared ideas on how the profession can shape the health care agenda for the future. In addition, they were also asked to answer how nurses can help to achieve the WHO’s Sustainable Development Goals (SDGs) by 2030. This year’s selected nurse leaders driving the discussion are at varying stages of the ENL program. The participants selected were Chris Hinder, Tammie Breneger, Hollie Jaggard and Prachi Javalekar. Read on to find out what each ENL highlighted as of concern to the future of the nursing profession. As an undergraduate student at the University of Wollongong preparing to enter the workforce, Chris is concerned about the implications that technology will have on informed patient consent as it is increasingly being integrated in the health care environment. Chris also highlighted quality education as a method of delivery of the WHO SDGs, by empowering nurses in regional areas to broaden their scope of practice, which would result in improved public access to health care and help to promote positive health outcomes. Chris became interested in the profession of nursing after completing an advanced first aid course in the Australian Army Reserves. The instructors conducting the course inspired him to pursue a career in nursing. Tammie has expressed that the provision of community-based mental health services in rural and remote areas will continue to be a main concern of health care delivery. Regional areas tend to experience poorer health outcomes, and this is in part contributed to the lack of access to health services, shortage of professionals to provide the necessary services, and the stigma attached to mental health issues in the bush. In response to how nurses can help to best deliver the WHO Goals, Tammie acknowledged gender equality and empowerment of all girls and women. In a predominantly female profession, it is interesting to see that there are still long-held perceptions and misconceptions of women as being ‘inherently less’. Tammie is actively involved in peer mentoring first year students and clinical skills mentoring for second year students. She is also the student representative for the Student Misconduct Appeals Committee and the School of Health and Human Sciences Discipline Committee at Southern Cross University (SCU), Coffs Harbour campus. The impact of technology was also the topic that Hollie chose to expand on when exploring the issues relating to future health care delivery. In a dissimilar vein of thought to Chris, Hollie focused on whether a nurses’ role in delivering care would be changed and how that might be addressed as advancements are made. By improving vaccination rates, antenatal care, sexual health and basic education, Hollie believes that the health of developing countries will contribute to ensuring that the WHO Goals are on its way to succeeding. Nurses can play a major role in delivering the initiatives to promote and protect health, make well-informed decisions and advocating for the access of health care. Hollie found nursing through a chance encounter in 2011 while looking for a career change. She hopes to complete her Master of Nursing (Emergency Stream) next year at Monash University and enrol in her PhD in 2020. Prachi’s research on this topic led her to discuss the current burden of non-communicable diseases in Australia and how we might tackle these in the coming years. Her thoughts included addressing the general health of Australians, and attempts to lower rates of obesity and encourage healthy eating and exercising. To reach the SDGs, she suggested partnering with our governments to ensure that health remains a priority for our environment. Prachi’s passion to improve health outcomes motivated her to pursue a career in nursing. She attended the 25th Quadrennial Congress of the International Council of Nurses as an ambassador of Sydney Nursing School in 2013. Her aspirations are to work in the area of patient safety and contribute towards delivering highest quality of care possible. Thanks for sharing this post. It is very important to know what will happen in future in the health care department. It is really an informative article. Even the dental health care department will also go through various improvements and changes in the field of cosmetic dentistry, child dentistry etc.